New data visualizations from the NASA Center for Climate Simulation and NASA's Scientific Visualization Studio show how climate models -- those used in the new report from the United Nations' Intergovernmental Panel on Climate Change (IPCC) -- estimate how temperature and precipitation patterns could change throughout the 21st century. For the IPCC's Physical Science Basis and Summary for Policymakers reports, scientists referenced an international climate modeling effort to study how the Earth might respond to four different scenarios of how much carbon dioxide and other greenhouse gases would be emitted into the atmosphere throughout the 21st century. The report by the UN's climate panel details the physical evidence behind climate change. On the ground, in the air, in the oceans, global warming is "unequivocal", it explained. To contain these changes will require "substantial and sustained reductions of greenhouse gas emissions". After a week of intense negotiations in the Swedish capital, the summary for policymakers on the physical science of global warming has finally been released. The first part of an IPCC trilogy, due over the next 12 months, this dense, 36-page document is considered the most comprehensive statement on our understanding of the mechanics of a warming planet. It states baldly that, since the 1950s, many of the observed changes in the climate system are "unprecedented over decades to millennia". Each of the last three decades has been successively warmer at the Earth's surface, and warmer than any period since 1850, and probably warmer than any time in the past 1,400 years. "Our assessment of the science finds that the atmosphere and ocean have warmed, the amount of snow and ice has diminished, the global mean sea level has risen and that concentrations of greenhouse gases have increased," said Qin Dahe, co-chair of IPCC working group one, who produced the report. The Intergovernmental Panel on Climate Change (IPCC) was founded 25 years ago to provide authoritative assessments on the emerging problem of climate change. Since its first report in 1990, the IPCC has issued increasingly complex follow-ups about every six years. The climate models that feed into the assessments have grown bigger and better, but researchers have not succeeded in reducing some key uncertainties about climate change. Where the reports have grown most firm is in declaring that humans are causing the world to warm. Speaking at a news conference in the Swedish capital, Prof Thomas Stocker, another co-chair, said that climate change "challenges the two primary resources of humans and ecosystems, land and water. In short, it threatens our planet, our only home". Since 1950, the report's authors say, humanity is clearly responsible for more than half of the observed increase in temperatures. But a so-called pause in the increase in temperatures in the period since 1998 is downplayed in the report. The scientists point out that this period began with a very hot El Nino year. "Trends based on short records are very sensitive to the beginning and end dates and do not in general reflect long-term climate trends," the report says. Prof Stocker, added: "I'm afraid there is not a lot of public literature that allows us to delve deeper at the required depth of this emerging scientific question. "For example, there are not sufficient observations of the uptake of heat, particularly into the deep ocean, that would be one of the possible mechanisms to explain this warming hiatus." "Likewise we have insufficient data to adequately assess the forcing over the last 10-15 years to establish a relationship between the causes of the warming." However, the report does alter a key figure from the 2007 study. The temperature range given for a doubling of CO2 in the atmosphere, called equilibrium climate sensitivity, was 2.0C to 4.5C in that report. In the latest document, the range has been changed to 1.5C to 4.5C. The scientists say this reflects improved understanding, better temperature records and new estimates for the factors driving up temperatures. In the summary for policymakers, the scientists say that sea level rise will proceed at a faster rate than we have experienced over the past 40 years. 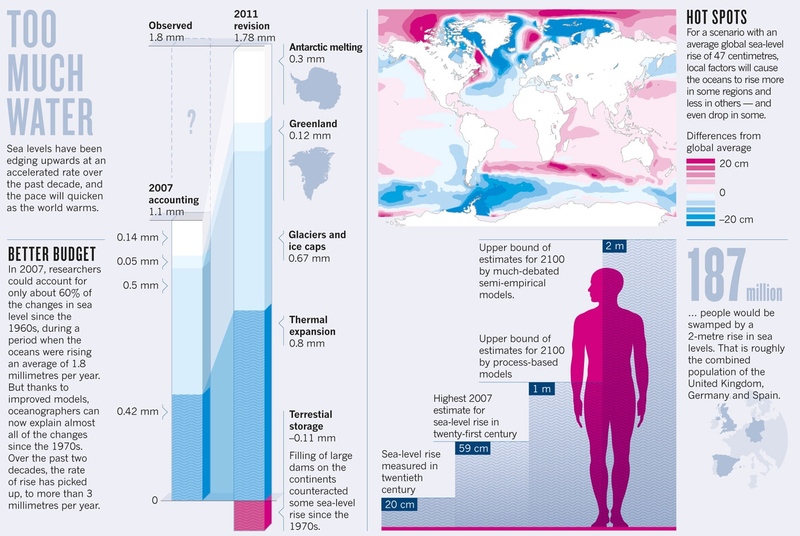 Waters are expected to rise, the document says, by between 26cm (at the low end) and 82cm (at the high end), depending on the greenhouse emissions path this century. The scientists say ocean warming dominates the increase in energy stored in the climate system, accounting for 90% of energy accumulated between 1971 and 2010. For the future, the report states that warming is projected to continue under all scenarios. Model simulations indicate that global surface temperature change by the end of the 21st Century is likely to exceed 1.5 degrees Celsius, relative to 1850. Prof Sir Brian Hoskins, from Imperial College London, told BBC News: "We are performing a very dangerous experiment with our planet, and I don't want my grandchildren to suffer the consequences of that experiment."